The reasons for this are the good economic conditions and high level of tax-receipts. For Finance Minister Wolfgang Schäuble (CDU) this surplus turned out to be double as much as was expected in November. 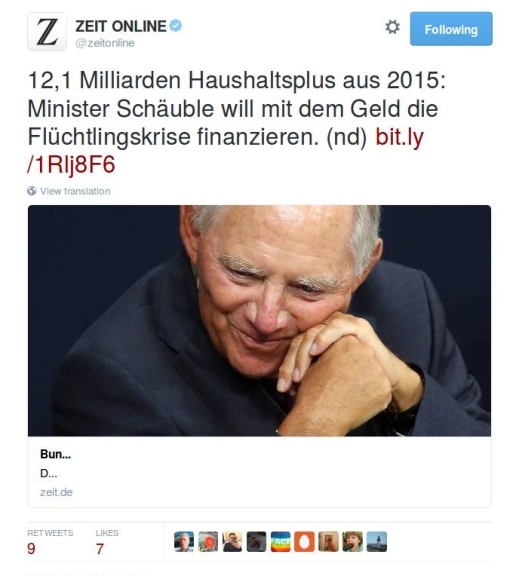 No wonder we see Schäuble there leaning on his hands with such a smug look on his face: for him, it’s job well done! Actually, good economic conditions pretty much automatically mean high tax-receipts, at least for any government which has its act together in the tax-collecting department, which Germany certainly does. But where did those good economic conditions come from? Well, the Germans do what they do well, as everybody knows; among other things, that means a healthy Mittelstand or layer of mid-sized companies (usually privately owned) making all sorts of capital equipment held in such regard by the rest of the world that demand for it is largely price-inelastic (that is, that demand takes little or no hit even if prices rise, e.g. due to currency fluctuations). The result is Germany’s long-standing status as the world’s #1 exporter, these days contested only with China. So Where to Spend the Bounty? That big pot of money is there – billions of euros, twice as big as had been expected – so the question naturally arises: What to do with it? Ideally, having accumulated in German Federal coffers, the money would be spent in such a way to recycle it back to the other EU states from which it largely came, in such a way to share the wealth and the prosperity a bit more broadly around the European continent. This could be something as simple as an accelerated raising of German workers’ wages, so that they spend more and some of that more they spend are goods and/or services from elsewhere in the EU. There is also another consideration. Successful governing in Germany necessarily means keeping in the back of one’s mind the Biblical tale of Joseph in Egypt, of the seven fat years followed by the seven lean years. German official have to be especially careful with their budgets, considering that an amendment they passed to their Constitution in the recent past mandates that the federal budget deficit be no more than 0.35% of GDP – and that provision comes into effect starting now, in 2016. That means any surplus – no matter how unexpected it may be – to some degree must be husbanded with a view for any bad times ahead (although that same amendment permits greater deficits than 0.35% of GDP in case of national emergencies, whether economic or natural-disaster in nature). 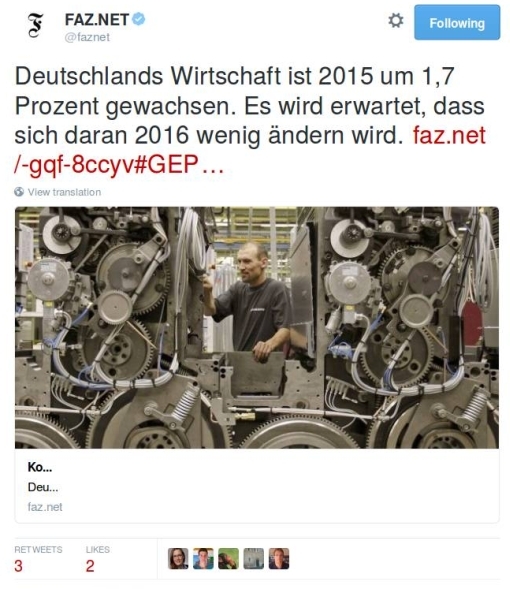 Germany’s economic growth for 2015 is expected to come in at 1.7%. What is more, more-or-less the same rate is expected for calendar 2016. Many would see that as low – especially in comparison to economic growth in developing countries, especially China. It’s pretty much also low in comparison with rates that the US is starting to hit again. Still, in absolute terms you could say 1.7% is low. As we see, Germany has been able to extract from that a very nice federal government budget-surplus. But one must still be cautious. Threat identified! Threat identified! Prof. Krugman, please call your office! And coming out of France, of all places! I thought liberals like Krugman were always in league with those cheese-eating surrender-monkeys! Writing in the Walloon (i.e. Belgian-French) business newspaper L’Écho, in a piece somewhat sarcastically entitled The euro, our Savior, Marc Lambrechts makes a brief macroeconomic survey of the current European scene and comes up with a couple paradoxes. It looks like everybody is feeling better now about the business conditions, as surveys carried out within the Eurozone among both businessmen and consumers show. But this might be nothing more than spring-fever; Lambrechts prepares us for the shock that first-quarter 2010 economic reports are going to bring, showing a marked slowing-down then (e.g. German GDP drop of 0.4%) caused mainly by the severe winter weather and the sharp drop in auto-sales from the expiry of all those national “cash-for-clunkers” purchase-subsidy schemes. Surely recovery will come about eventually, although with regard to Europe generally economists at the OECD are not optimistic about that happening until the second half of this year. One way for Germany to expedite that for itself, though (since the Germans earn so much from exports), is to get the euro to fall in value against the other major world-currencies – a process to which nothing has contributed more lately than the continuing confusion in the financial markets over Greece’s fiscal problems, which German obstinacy and tight-fistedness at the EU level has only prolonged. “A curious paradox,” Lambrechts calls this. UPDATE: Strangely, the performance-vs.-confidence balance seems to be reversed in the US, as per this article from the New York Times. Need a job? Well, do you speak Chinese – in particular, Cantonese? While throughout most of North America and Europe the financial crisis and its dire economic effects are still on-going, as Germany’s Die Zeit now reports, In China manpower is lacking. I make reference there to “Cantonese” because the really acute labor shortages are showing up in those regions of the southeast that have long claimed the lion’s share of China’s export-oriented industry. Guangdong city alone (it used to be known as “Canton”) is said to lack 2 million workers. But everywhere in that part of China there are phenomena which point clearly to increasing desperation from employers when it comes to finding workers. Unemployed-looking people are accosted on the street and at train stations, by eager recruiters wearing “Welcome!” T-shirts; local authorities stage job-fairs, but nobody bothers to show up. And the like. For, to hear this piece tell it, China certainly is not suffering from any recession, not any more: exports are now back to their 2008 levels and rising. Keep in mind, it’s also not especially highly-trained or -educated workers that are sought (although, if you’re seriously thinking about making the move yourself, learning the language could indeed be a complicating factor). Remember, that has not been China’s traditional manufacturing paradigm in any case, which instead has been based on cheap, simple manufacturing, performed by basic, lowly-paid workers – reinforced annually by as much as 150 million new people moving in to the big cities from off the farm to find a job and sample urban life. Presumably that stream from the countryside is still there, but businessmen are still having problems recruiting a work-force, even as wages rise 10% a year and even 20% annually in the “hardest hit” (in terms of worker-shortage) areas. If conditions are indeed anything like how they are reported here, all this has to call into serious question that “simple, cheap manufacturing” economic model. China may be about to lose its reputation as the place you go to have your stuff made at rock-bottom costs; time to go elsewhere for that. (Myanmar? Mongolia?) Still, not only is there indeed a new Chinese capability coming on-line for higher-value, quality production, but business leaders there are also convinced that the country has accumulated an expertise in supply-chain management that should keep it very competitive for some time to come. What’s Chinese for “Starbucks”? Did you catch the news about how China is now the world’s biggest exporter in absolute terms, having recently eclipsed Germany? Or how the Middle Kingdom is very close – almost there, 9 out of 12 months last year – to passing the US as the world’s largest car market? Chinese households are earning more and saving less. In consequence, Credit Suisse estimates that the Chinese could dethrone the United States at the first world-rank of consumption around 2020. Yes, this pronouncement is based upon a survey that Credit Suisse recently did towards the end of last year among 2,700 respondents in eight major Chinese cities. In particular, this showed that Chinese personal saving rates have fallen from 26% in 2004 to 12% last year. Where does all that newly-free income go? For now, the report says, it’s going to real estate and to cars, but it’s also starting to go into consumer goods, too. “The big international brands are rubbing their hands” in glee about this, writes De Foucaud, but they need to be careful: Chinese companies are getting ready to challenge foreign firms for these new consumers’ Yuan across-the-board, including in the high-tech and luxury sectors where up to now they have been absent. From my reading of recent macroeconomic commentary, this increase in consumer spending is a quite healthy development towards “re-balancing” the recession-struck world economy, so it can’t come soon enough (indeed, in this perspective 2020 looks rather too far off). On the other hand, the strong economic growth that is behind these developments is also making China more into a nation of “haves” and “have-nots,” i.e. with top-earners enjoying much more income growth than the rest, and this itself is a dangerous development in traditionally-egalitarian Chinese society. She’s known mainly for being ultra-polite and proper, God bless her, but even Queen Elizabeth II reached the point at the end of last year when she couldn’t restrain herself anymore from asking, while visiting the London School of Economics, “How could no one have foreseen it?” “It,” of course, was the catastrophic banking/financial breakdown that had come to its terrifying climax the previous September – almost one year ago now – and plunged most of the world into grave economic troubles, her own sovereign realm definitely not excepted. Putting Her Majesty’s query in another form, How did economists get it so wrong? Or, if you like: What were they thinking? Whichever way it is stated, the issue is no doubt a complicated one, not to mention rather embarrassing for that profession of economists from which one might still assume that the best answers might ultimately come. And by now they are coming: the previous two hyper-links, in fact, take you directly to major pieces on the evident failure of modern economics by Paul Krugman (in the New York Times Magazine) and by Francis Fukuyama (together with Seth Colby).